PRODUCT: 7 inch Brick Trowel / Pointing Trowel. Philadelphia style. Hardened and temperered steel blade. Price/Each. 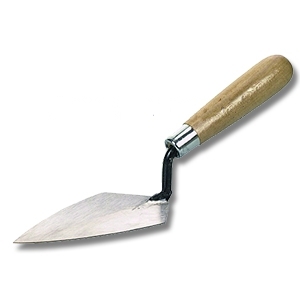 DESCRIPTION: This Philadelphia style Brick Trowel has a high qualiity tempered steel blade made for durability. Along with a comfortable wood handle with secure grip, this is the perfect masonry tool for concrete, brick, and even gardening applications. Find this and other trowels at BestMaterials.com. Margin Trowell, 2 x 5 inch with Lacquered Hardwood Handle, Professional Grade. Price/Each. Round Nose / Bull Nose Steel Gauging Trowel, 7 in. Long x 3-3/8 Wide Blade, with Hardwood Handle. Price/Each.